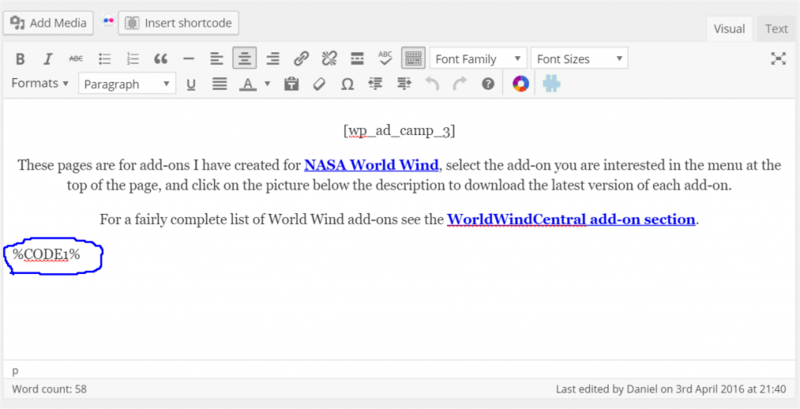 I have been doing a little experimentation on getting NASA WorldWind inside WordPress as it’s not as easy as simply pasting the code from Web World Wind into a page, that’s not to say it’s hard, it just requires a little research. Add the Per Page Add to Head plugin. Add the Code Embed plugin. Go to the page or post you want to add WorldWind to. Go to ‘screen options’ in the top right and select to enable Custom Fields. // Define the event listener to initialize Web World Wind. // Create a World Window for the canvas. // Add some image layers to the World Window’s globe. // Add a compass, a coordinates display and some view controls to the World Window. Open your page and you should see a spinny globe! This entry was posted in Geeky and tagged NASA, tutorial, wordpress, World wind, worldwind. Bookmark the permalink.